Antiaging skin care treatment trends are ever-changing. The constant interest and demand for new skin care and beauty products keeps the anti-aging market thriving. Thanks to technology we have amazing options to choose from to see what works for our own personal needs. Some skin care trends are short lived, some last forever and keep improving, and alot are newly introduced to test their effectiveness. We are always hopeful to discover the next antiaging potion or magic wand gadget. Lets re-discover "tried and true" skin care options and introduce a few fairly new to the scene. Micro needling has been around for some time and continually shows impressive results. Of all the antiaging skin care treatment techniques to help reverse the signs of aging, this treatment is a great addition to your anti aging arsenal for all parts of the body with little downtime. Using our own body’s natural healing process together with today’s medical technology we can trick our body to produce more collagen to strengthen our skin’s connective tissues and support system. These controlled injury anti aging treatments use fine, thin ,varying length needles to penetrate and create micro-tiny puncture wound channels in the skin. This injury signals our body to repair the damaged area. The healing process increases cell turnover and stimulates the growth of collagen protein and elastin fiber production. Collagen adds volume and smooths the texture of our skin, reducing fine lines and enhancing elasticity. This treatment is also known as dermarolling or collagen induction therapy. Treatments can be done by an aesthetician, dermatologist/physician or available as at-home devices. We all know the benefits of honey. The New Zealand manuka form of honey is the most beneficial and more potent than regular honeys . 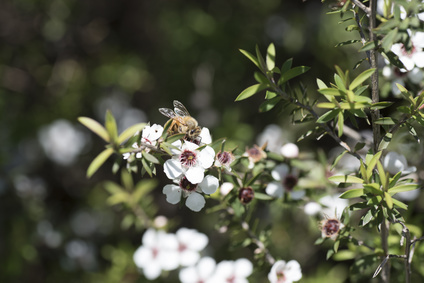 The native,New Zealand manuka bush is pollinated by bees to produce manuka honey. This type of honey contains the highest amount of healing properties (metylglyoxal(MGO) that help prevent and heal fungal and bacterial infections. The hydrating properties helps replenish moisture back into your skin and hold it there. Manuka honey is richly loaded with nutrients and antioxidants that make it an ideal product to include in antiaging treatments to help protect the skin from free radical attack. This amazing natural substance shows impressive results for aging skin. It helps in cell renewal to keep complexions looking young and vibrant. It also encourages the body to produce more collagen protein and elastin which supports our skins firmness and elasticity. Many types of quality, antiaging skin care treatment products now contain Manuka honey to rejuvenate and improve skin. Aids in the healing process of wound infections. Buy from a reputable source. Look for 100% natural Manuka honey that has the UMF quality trademark on the label. The UMF (Unique Manuka Factor) is a world-wide strict standard to identify and measure the quality antibacterial strength of Manuka. The UMF strengths vary- the higher the number indicates a higher MGO grade for the best benefits. Hyaluronic Acid is one of the antiaging skin care treatment ingredients known for its hydrating benefits. It helps to attract and retain moisture, provide cushioning, plump the skin,and help create a protective barrier. This amazing natural, gel-like substance is one of the most beneficial ingredients to keep skin supple and give structure and support to the entire body. The exceptional ability to keep skin constantly replenished with a vast amount of moisture will maintain soft, smooth, firm skin. As we age, our hyaluronic acid levels depletes and our skin loses its ability to maintain its hydration so our skins plumpness, firmness and suppleness decreases. The result is dull, drier, saggy skin. The appearance of fine lines and wrinkles become more visible. Today, HA can be found in numerous anti aging products to help hydrate dry, aged skin. It is especially popular in moisturizer products to help maintain moisture levels in the skin surface layers. HA cannot penetrate into the deeper layers of the skin because of its large molecule weight so HA filler injections may be a consideration to add volume to the underlying dermal layer. Fillers help reduce wrinkles and make the skin look smooth, supple, and younger. Stem cell technology continues to show age defying results. Multiple plant-derived stem cell treatment options are available to penetrate deep into the dermal layers of the skin to treat old and inactive stem cells and boost collagen . Promising products that have cutting edge ingredients to help reactivate cells to continue enriching and restoring skin at the cellular level to a healthier and younger appearance are becoming available. Keep yourself updated -Stem cell therapy research is still very new in the field of anti aging skin care science. We all have heard the health benefits of adding live bacteria or yeast microorganisms from cultured foods such as yogurt, sauerkraut, or microbe beverages such as kefir or kombucha into our diet. Taking probiotic dietary supplements can also promote good health and help maintain a healthy immune system by boosting your levels of good, healthy bacteria. Probiotics can help restore any in-balance going on in the body that can result in inflammation or disease. Studies show ingesting probiotics not only help reduce any gut inflammation and restore the intestine wall but it showed improvements to the skin such as a cleared complexion, easing redness and calming inflammation. Along with the popularity and huge interest in skin care ingredients that truly make a difference, probiotic-based skin care products and makeup may be the on-going buzz. This is a promising new direction for antiaging skincare. Our skin’ immune system consists mainly of the friendly, beneficial bacteria that help guard against environmental aggressors and premature aging. When this line of defense becomes off balance the skins barrier is weakened. Pathogens (harmful bacteria) can then increase and outnumber the good bacteria and we become more susceptible to many skin problems and accelerated aging. Adding probiotics into your skin care regimen may help to strengthen our skin’ natural defenses and guard against premature aging. The use of topical probiotics can be extremely useful for controlling inflammatory conditions such as acne, eczema,and rosacea. Look for antiaging skin care treatment products that contain the actual probiotic cultures or has specially formulated nutrients that include extracts from bacteria groups such as bacillus caogulans, lactobacillus, or bifidobacterium strains that are naturally found in fermented foods.